A comma—it’s just a pause separating one thought from the other, a breath in between the beginning and the end. But in that short breath, there’s much to be explored as Vivian Bearing, the protagonist in playwright Margaret Edison’s first and only play, the Pulitzer Prize winning Wit, finds out. MIGHTY AND DREADFUL : Vivian Bearing (Megan C.C. Walker) begins to rethink her life’s focus on knowledge over compassion after she’s diagnosed with terminal ovarian cancer. Vivian is an academic, a highly successful English professor who specializes in the poet John Donne’s Holy Sonnets. Her world is small, consisting of work and the English language, until one day she’s diagnosed with terminal ovarian cancer. Megan C.C. Walker, tapped to play Wit’s leading lady, wanted to tell Vivian’s story. But how do you play a woman dying of a cancer that you’ve never experienced? 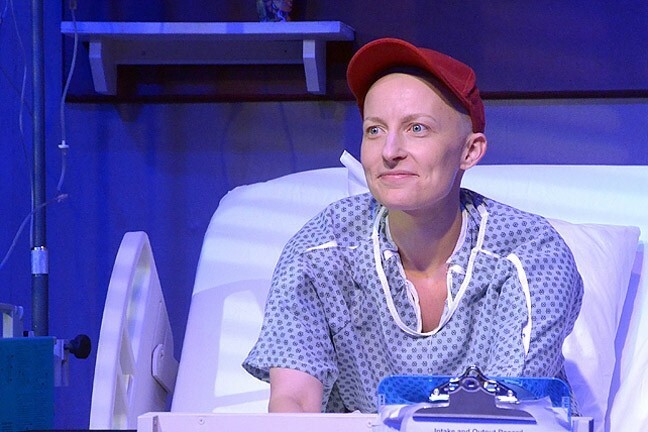 In an effort to really show audiences what the process of being diagnosed and living with ovarian cancer is like, the Little Theatre collaborated with professionals from the Hearst Cancer Resource Center and Wilshire Hospice. DEATH, BE NOT PROUD: Vivian Bearing (Megan C.C. Walker) is comforted in the hospital by her one and only visitor, her former mentor and professor E.M. Ashford (Rosh Wright). “They were our eyes and ears for how accurately we were portraying everything about these characters,” Kelly Fidopiastis, the play’s director, said. For instance, what does it actually feel like to have cancer? Like Walker, Luiza Dutra, a registered nurse and director of patient care at Wilshire Hospice, wanted people to hear Vivian’s story because it’s a story she sees patients living every day. WE WAKE ETERNALLY: In a quiet moment of compassion, Vivian Bearing (Megan C.C. 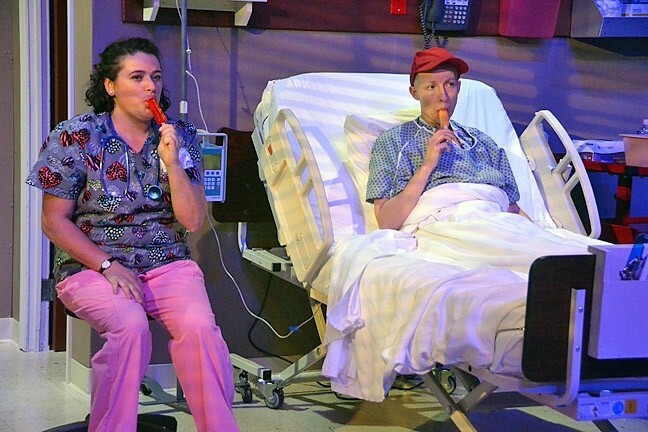 Walker)enjoys a Popsicle with her nurse Susie Monahan (Kerry DiMaggio), one of the only people at the hospital who treats her like a human and not just research. Dutra advised the cast on little things, like the placement of a patient’s wheelchair, and bigger things, like when that compassionate, human connection between a nurse and patient would first happen. She spoke of how a nurse might sit on a patient’s bed to comfort them and also told Walker that the pain should be a lot more animated. And on the surface Wit can be viewed as a play that’s simply about death, but really it’s about living. In a flashback scene, Vivian’s former professor E.M. Ashford (Rosh Wright) admonishes her pupil for using the wrong punctuation in her paper on Donne’s Holy Sonnet X: Death Be Not Proud. 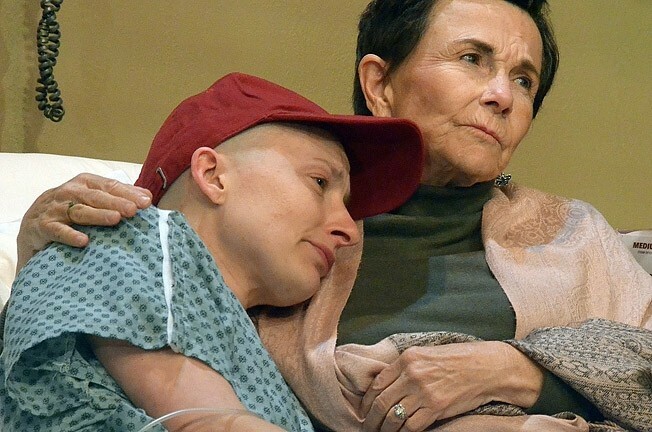 LIVE LIKE YOU'RE DYING : Catch 'Wit' at the San Luis Obispo Little Theatre before the play’s short life there comes to an end on May 15. Tickets range from $15 to $30 and are available online at slolittletheatre.org. “It reads, ‘And death shall be no more’ comma ‘death thou shalt die.’ Nothing but a breath, a comma separates life from life everlasting,” the professor tells young Vivian. Ryah Cooley is taking a deep breath at rcooley@newtimesslo.com.